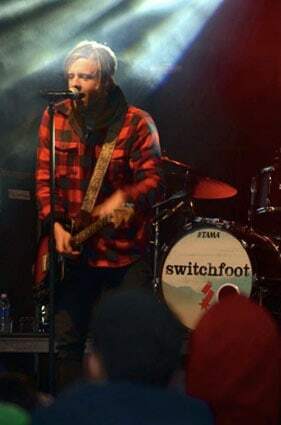 Switchfoot frontman Jon Foreman had the crown singing along at Okemo’s Sugardaze festival, March 14. LUDLOW—Okemo Mountain hosted a free music event Saturday, March 14, featuring local band CK3, Brad Corrigan of Dispatch and headliner Switchfoot. With beer and maple syrup flowing, the Sugardaze Festival provided a memorable experience for both skiers and locals alike. CK3 kicked off the afternoon with energizing rock favorites like Phish’s “Birds of a Feather,” as the crowd of over 1,000 gathered at the Jackson Gore Inn courtyard. Brad Corrigan of the Indie/Roots band Dispatch rocked the second set as a mixture of rain and snow fell upon a crowd of dancers. Braddigan, as he is often known on stage, is a Colorado native who played Lacrosse at Middlebury College before forming Dispatch, a widely popular band, in Boston in 1996. The on-again-off-again band, who has gained world-wide recognition for its unwavering dedication to humanitarian causes, called it quits in 2004 but briefly reunited to perform at Madison Square Garden to raise money for Zimbabwean humanitarian efforts. That show placed Dispatch at the top of the list as the first Independent band to sell out the notable venue. Again in 2011 Dispatch came together, selling out its U.S. tour. Dispatch will take the stage at Madison Square Garden on July 10 and 11, 2015 featuring Dr. Dog and the John Butler trio, to shine the light on the issue of hunger in America. The group prides itself on not necessarily fitting into a certain genre—although it’s most often labeled as a Christian rock band and earned a Grammy in 2011 for Best Rock or Rap Gospel Album. The sound is filled with raw vocals, high powered guitar riffs and synthesized experimental sound. The “Switchfoot Sound” is also coupled with a truly interactive performance and melodic, soft ballads. Front man Jon Foreman belted out crowd favorites like “Dark Horses” and “Meant To Live” and covered both Tom Petty and The White Stripes. Crowd members couldn’t help but sing along as the band’s humble approach and audience connectivity shone through their music. These ocean surfers-turned mountain rockers left you feeling both inspired and uplifted. Switchfoot heads to Colorado, March 21, to perform at Okemo’s sister mountain, Crested Butte, before heading to India March 25 to begin an international tour. More spring fun is on deck for Okemo Mountain Resort, too, as it hosts Hops on the Snow Brewfest March 28, 11 a.m. to 4 p.m. at Jackson Gore Inn.